Web2day, a two-days event, in Nantes (France), gathering 1,200 people be they entrepreneurs and startups, VCs, investors, mentors, enthusiasts, etc … . An event branded by some as a number two LeWeb even before it happened. An event called a second LeWeb in France after it actually happened. So, some days (well, more than I would have initially wanted I must admit) after Web2day, what is there to keep from it ? Nantes is not Paris. Of course. But it is still not too far (call it a two hours ride by train) hence appealing to the Parisian ecosystem too. Especially when the Gods offer a sunny outfit to the city – and event – at a time when the weather is so awful I am flying to Scotland to find some sun. In Nantes, there are also great places and buildings. The former factory, turned conference center, where the event was held was just the perfect place for a cool startup event. And where else do you face some crazy mecha-elephant when arriving on site ? As mentioned above, Nantes is quite close to Paris … . Two hours is not necessarily a lot more time than the one wasted in traffic congestion around Paris; apart that, here, it means traveling hundreds of kilometers. And this helped driving a huge amount of people from Paris and surroundings to this event. There was a crowd. And the crowd was of quality. And so were the speakers with quite a high level crew gathered to take the stage. Mentioning just a few would be an offense to others so let me take the easy route and just link to the website where the list of speakers sits. And the startups then ? 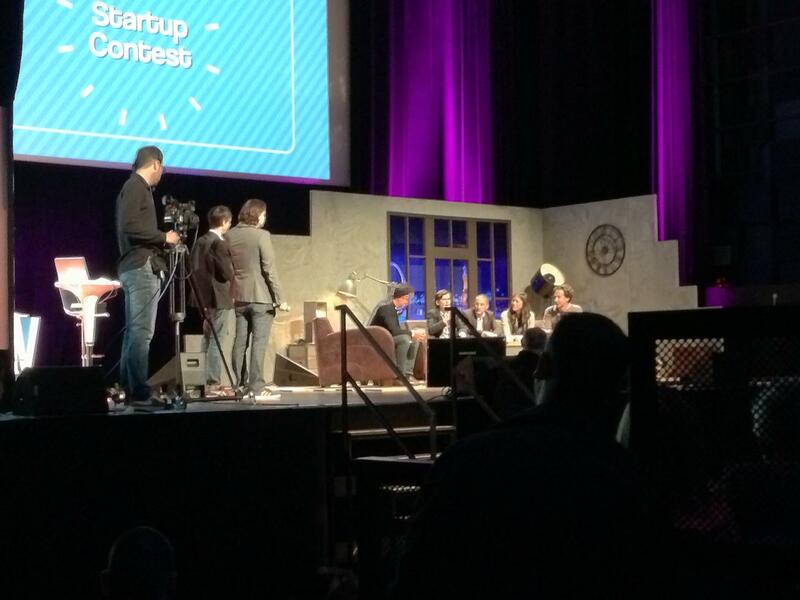 Well that was around forty ones selected for the Startup Contest. And it definitely showed that France can deliver when it comes to quality startups. An eye to be kept on the likes of Bringr and Bunkr. On top of that, what does make an event successful ? Its impact, the noise it makes over the marketplace. And that event has made quite an impact with, as an example, Twitter hits in the region of 5,000 over the two days (with hashtag #web2day). Plus the momentum is not lost yet with various bits showing up in the press and social media. Well Web2day, pressure on for next year then as besting a success is the biggest of challenges – but the most interesting too. But. There is always a “but” and I have a few to name. Good news, hints for improvement. On arrival, I was greeted in some weird way by the “security”. My guess being the organizers had hired the local Hells Angels as bouncers. Apart from the funny picture – and I know that these guys are not my friends – the welcome was truly screwed up. Coming in, on a sunny day, for a cool conference and ending up, a couple of minutes later, wondering whether the next step is a dog fight with some random bouncer … . Next step, not yet in my “where is Wally“-like journey to get my badge (and finally put a smile on the face of my unfriendly friends the bouncers). Good point the people were truly nice. Bad point, I made four stops before being finally sorted. Finally in. I mentioned the fact that Nantes is close (enough) to Paris which certainly helped bringing in a lot of Parisians. The good of it is also its bad as, then, the place was packed but with the same faces to be met in any of the numerous talks, events, etc… held in Paris. No frustration involved but a wee smile on our face when crossing paths and listing the people met already. A solution to that (maybe): go (more) International. One surprise for me was the fact that almost no English was spoken over the two days. Apart from a couple of workshops and a series of startups pitches … which took Twitter for one reason : people definitely need to work their English … . Apparently next year should be half French, half English. This does sound more appealing on paper. Wait and see then. A last bit on speakers. I spoke about the strong set of people lined up on stage and that is a fact. There were a lot of good speakers. Now, as in any event, nothing – and nobody – is perfect. So we faced the good, some bad and a couple weird ones. Here I just look at them the same way as mentors; whatever your entrepreneurial achievements are, that does not make you a good mentor or speaker. In the end, this event deserves its branding as a smaller LeWeb. The people, the dynamics, the place, everything made it a wonderful time and I have seen so many people leaving with stars in their eyes that it just confirms how good that was overall. Bring on Web2day – or “Web3day” – 2014!